Just because your land is sloped doesn’t mean building a workshop, storage, agriculture, or another type of shed is impossible. There are a few more steps and considerations, but done properly, it could end up being the best use of that otherwise wasted space. Here’s what you need to know. The paving slab and timber sleeper foundation can accommodate a small slope if you cut a little on one side of the slope and build up crushed stone on the other. For this article, though, we are focusing on larger sheds on steeper slopes. How Do I Deal With Bigger Slopes? If you cut into a slope to put your platform in – even if you use the soil you’ve excavated to build up the platform, you may need a retaining wall to hold back the ground that’s above the base of the shed. It may be difficult to properly compact the soil in any event, and in many cases, you may have to move more soil than you’d expect. If this retaining wall is under a 500mm tall, some people have built it themselves. For those who are properly treating the shed as an investment to be used for years to come – or for any project that will require a retaining wall that 500mm or more metres tall, you should obtain professional advice from a builder or engineer. You will want their assessment of ground stability and the proper design for the retaining wall. Your ideal shed – and shed design – will depend on a number of factors you should address at the outset. Ask yourself these questions. What is the intended use of the shed? A workshop or storage shed on a slope may not be a problem, especially if you don’t plan on moving large, bulky, cumbersome items back and forth, or if you can install a ramp or other solution. It would not, however, be recommended to build a shed that would function as a barn for livestock, for example. The difficulty the animals will have going in and out would likely negatively affect the cattle flow and accidents are more likely to happen. What kind of planning permits are needed? This will depend of course on where you are, as different municipalities have different permitting systems. There may be different requirements for different heights or area or setbacks which may make you reconsider your design. Where should I put the door? You want the entrance and exit as level as possible, and its location will depend on whether you’re gone the retaining wall route or the deck route. With a retaining wall, the door should be on the lower part or side of the slope. With a deck, your door would be at the top or side of the slope. Do I have enough room for maintenance? This is more of an issue if you have a retaining wall. There should be enough room to access the entire perimeter of the shed for maintenance purposes, so the shed should not be built too close to the wall. If it’s too close, the shed would get a lot of rain water splashing against it off the top of the retaining wall and could get damp, anyway. Should I get advice or help? It is always prudent to get some professional advice – at the very least to see whether your project is feasible regarding safety, function, and cost. If you hire professionals to build the shed, you will at least be assured that your shed will be built to proper specifications, in accordance with your local planning regulations, and that it will last for years to come. 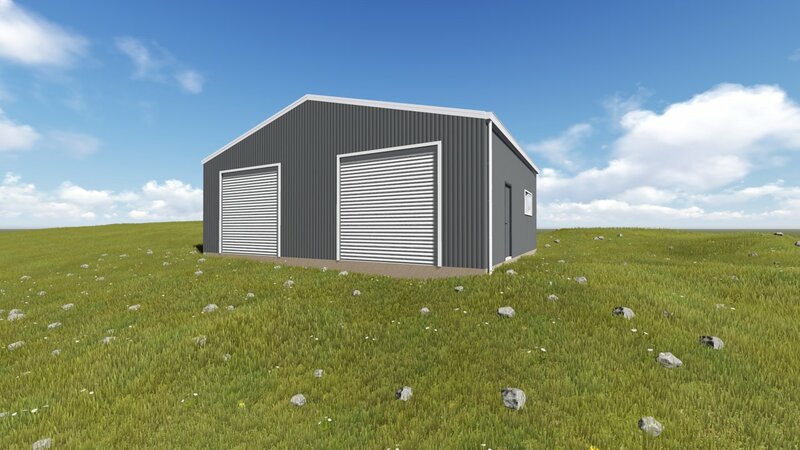 Action Sheds Australia is one of the leading steel shed designers and erectors in Western Australia, supplying and erecting kit-form BlueScope steel shed kits from the highest quality, most durable materials, and even assisting with planning and council regulations. Action Sheds kits are custom built to client requirements and are shipped anywhere in Australia; Action Sheds can also erect the shed for you. Contact us today and find out what kind of shed is best for you.